Use the form on the right to contact us with general questions. Use the "Consultation Request" button above to schedule a consultation. Sheer Descent waterfalls produce a clear arc of water, projecting away from the pool wall. Sheer Descent waterfalls produce a clear arc of water that can be adjusted from a silent, glass-like sheet of water to a rushing mountain waterfall. 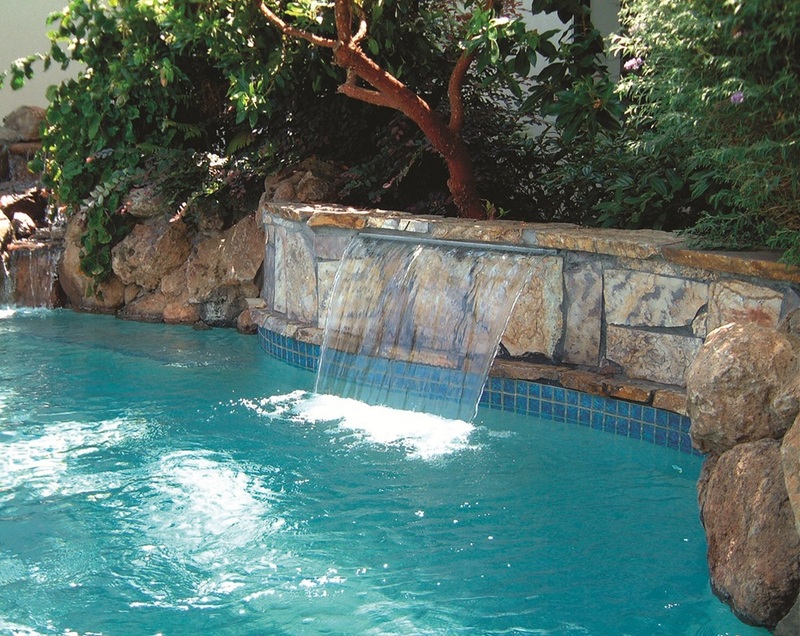 A captivating addition to any new, remodeled, or existing pool or spa, Sheer Descent Waterfalls are available in lengths from eight inches to eight feet, including curved and extended lip models. Choose from a variety of waterfall styles including Sheer Descent, Sheer Rain, Sheer Curtain, Sheer Arc and Rain Arc. Sheer Descents can produce a wide range of water effects and can easily be adjusted to suit any mood or environment. Sheer Descent Waterfalls are available in lengths from eight inches to eight feet, including curved and extended lip models. Available in white, light gray, and clear.